Beta-testing by Basti, Emily Boegheim, George Oliver, HenryMikel, James Jolley, Jeremy Rishe, Justin Lowmaster, Katzy, Lynnutte, Mario Carneiro, Poster, Sharon Rishe, and Victor Gijsbers. Spring Thing 2008: 3rd place of 3 games. Download bl-preview-1.zip from the comp site. Blue Lacuna (Aaron A. Reed; 26-Jan-2009; Glulx). Beta-testing by Alexei Othenin-Girard, Basti, Depresiv, Doug Egan, Emily Boegheim, George Oliver, HenryMikel, James Jolley, Jeremy Rishe, Justin Lowmaster, katzy, Lynnutte, Mario Carneiro, Neale, Scott Maddix, Sharon Rishe, Stephanie Camus, and Victor Gijsbers. XYZZY Awards 2009: Winner of four awards: Best Game, Best Story, Best Writing (tie), and Best Use of Medium. Was also a finalist for Best NPCs and Best Individual NPC (Progue). Visit the author's download page for downloads of this game. 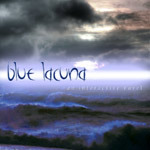 The full version of Blue Lacuna was released in tandem with a promotional web-experience called "blueful", where one followed a trail of links through several popular websites. See the Links section below for more about "blueful". Blue Lacuna - at IFDB. Blue Lacuna - at ifwizz interactive fiction (in German). Blue Lacuna is officially released! - Announcement on author's blog; January 28, 2009. Quote: "Blue Lacuna technically went live on Monday morning when blueful launched." Spotlight on Aaron Reed's Blue Lacuna - SPAG #54, March 31, 2009. Blue Lacuna Source Code - Aaron announces the release of the game's source code on August 14, 2010.
blueful - Announcement on author's blog; January 26, 2009. Blueful - Announcement on Christopher Armstrong's blog; January 26, 2009.
brasslantern: Aaron Reed launches prelude to Blue Lacuna - Announcement by brasslantern via Twitter; January 26, 2009.
blueful - Announcement on Mike Rubin's blog; January 27, 2009. See also: reactions and quotes. Review at Jay is Games by Karl. Exploring the 'Best Games': Blue Lacuna, by Aaron Reed - by Mathbrush. Review: 1, 2, 3, 4, 5, 6, and 7 by Carl Muckenhoupt. Review at IF-Review - by Dan Shiovitz. Review (archived) at Play This Thing!, review at GameSetWatch, and blog review (1, 2, 3, 4, 5, and 6) - by Emily Short. Blue Lacuna: An Interactive Novel - The Source. From this page, you may view online or download the source code. The PDF version runs to 736 pages. Blue Lacuna Transcripts Analyzed - Newbies playing this game at IndieCade 2010. This page was last modified on 26 December 2016, at 23:07.